Tools: What is a Rapid HIA? On the face of it Rapid HIAs are quick, but that’s not the whole story. 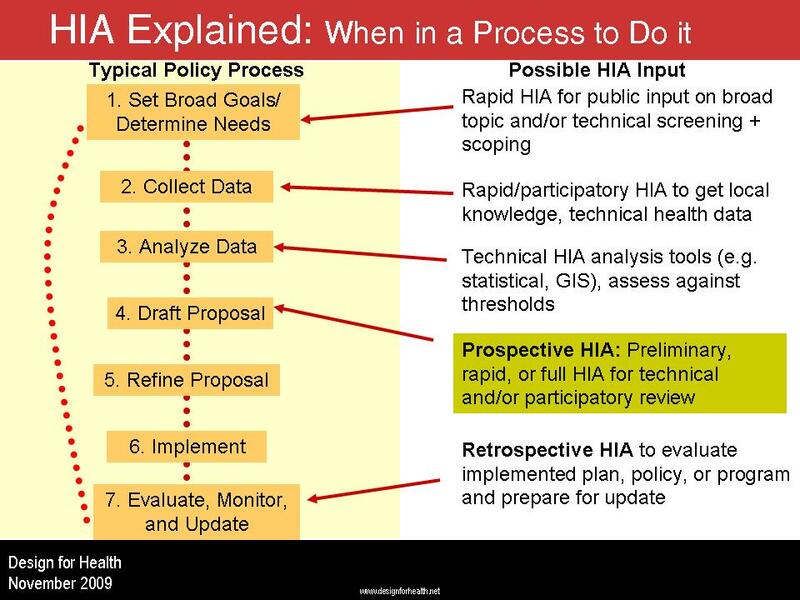 A rapid HIA while faster than a full, environmental impact assessment-style HIA, still takes some time. It is also different to some other quick HIA types such as desktop screening or scoping exercises. Fundamentally a rapid HIA is an interactive workshop—taking half a day or a day–that brings together stakeholders to identify and assess health impacts. However, additional time is needed to engage stakeholders in identifying key concerns and interest groups, to prepare background docuemtns for the workshop, have participants read those docuemtns, and write up the results. The good news is that a lot of the background information is similar to typical analyses that are standard in many planning and public health processes. Background information on health is available from several sources. Examples of completed HIAs are online. Several toolkits are also available. Design for Health has two versions. The most recent Rapid HIA toolkit was ublished in 2008 but will be updated over the coming year. It draws on a number of previous examples, including the famous Merseyside model. 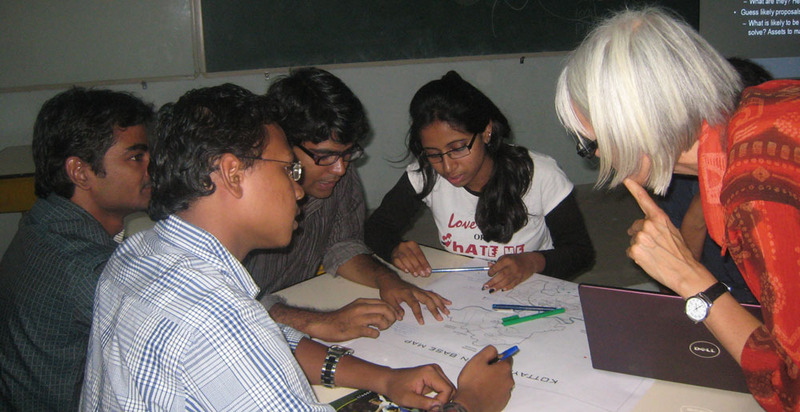 In 2010 DFH conducted a rapid HIA, termed a Healthy City Planning Workshop. This took a more flexible approach than the 2008 toolkit and also adapted worksheets from a number of recent HIAs. The reports from the workshop include basically all the information used to run and report on the HIA workshop–the actual information packet provided to participants in advance; the agenda of the meeting, copies of handouts, worksheets, and presentations from the workshops; a series of photos keyed to parts of the agenda; and the workshop’s summary report. This makes the report usable as a toolkit. The Merseyside Guidelines for Health Impact Assessment (2001) published by the International Health IMPACT Assessment Consortium, is often cited as the most widely used HIA model in England. Human Impact Partners, Oakland provides several relevant tools including a number of guides and worksheets: http://www.humanimpact.org/hips-hia-tools-and-resources. Be sure to scroll down the page because a lot of the more interesting material is at the bottom. When in the Planning or Policy Process Does a Health Impact Assessment Fit? Many people are interested in when to do an HIA. The simple answer is, it depends. There are a lot of different formats that may be used alone or in combination. They may also be done prospectively—to figure out what may happen—or retrospectively to assess what did happen. This latter version is often looked down upon as not sufficiently proactive. However, it can be a great way to start a new planning process—looking at the current state of affairs to figure out what to do next. This can be a lot less threatening than assessing a draft plan or policy that people already invested in. The attached diagram from a Design for Health training captures some of this variety. The Rapid Health Impact Assessment—the kind of HIA that takes the form of a structured workshop with substantial preparation and reporting—boasts a number of detailed manuals, such as the classic by Erica Ison: http://www.apho.org.uk/resource/item.aspx?RID=44890. However, moving beyond such general guidance it can be hard to find out how others have conducted their HIAs. Some people provide extensive background reports but not much about what actually happened at the workshops. Others focus on the outcomes of the HIA and not the inputs and process. An increasing number of practitioners are, however, reporting on HIAs in straightforward ways that provide transferrable tools for others. This entry highlights several of these, all containing useful examples of worksheets, maps, and recommendation checklists or tables. The London Olympics HIA, completed in 2004 is an example of a health impact assessment conducted on a major employment and housing development. Prepared by consultant for the London Health Commission and the London Development Agency, the HIA had two parts: a desktop assessment using many existing reports and a workshop with 21 key participants (including advocates, government representatives, academic and academics). The HIA looked at construction, operation, and post games time periods and the consultant produced a 155 page report, available online: http://www.apho.org.uk/resource/view.aspx?RID=61057. This comprehensive report contains substantial background information, results from exercises in the workshop including some interesting voting activities, and clear recommendations. The Lowry Corridor HIA of 2007, while an internally conduced assessment rather than a true participatory HIA, is a terrific resource. Focusing on the redevelopment of a major road in Minneapolis, the report contains several well thought-out worksheets and a number of interesting maps: http://www.apho.org.uk/resource/item.aspx?RID=60512. It is a very accessible document. Commerce City, Derby Redevelopment Area HIA is also not a traditional rapid HIA but it is included here for its imaginative use of participation and analysis tools. These range from computer mapping and proposals for street redesign to photos taken by residents and stills from a video produced by local high school students. Located in a lower income, majority Latino area of suburban Denver the HIA was conducted by the Tri-County Health Department who in turn employed short-term consultants on special topics. With a focus on physical activity and nutrition, recommendations from the 65- page report (http://www.tchd.org/pdfs/hia_final.pdf) fed into a master plan. The Arden Hills Healthy City Planning Workshop of 2010 assessed options for reusing a military facility in a suburb of the Twin Cities. The state Department of Health sponsored this HIA collaborated with the City of Arden Hills, hiring a consultant to actually conduct it (Design for Health). This is one of the very few HIA reports that includes basically all the information used to run and report on the HIA workshop–the actual information packet provided to participants in advance; the agenda of the meeting, copies of handouts, worksheets, and presentations from the workshops; a series of photos keyed to parts of the agenda; and the workshop’s summary report. 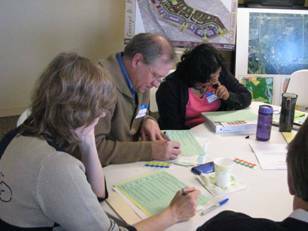 The summary report and appendices, along with a description of the workshop, are online: http://designforhealth.net/cases/arden-hills-2010-workshop/. More information about HIA in general can be found at http://designforhealth.net/hia/.